Housing is the biggest expense for most Americans and it accounts for more than 30 percent of a household’s yearly expenditures. Of course, housing costs vary greatly depending on where you live and whether or not you are a renter or owner. Some things to even think about before deciding to become a homeowner is the financial, and the emotional aspects. Obviously, you must have an established financial situation with a stable income before even looking into purchasing a home. Being emotionally invested is just as much of a factor, and before jumping into that kind of commitment there are lots of questions to ask. Am I ready to maintain a home? Can I pick a neighborhood where I can see myself and my family living in for a long period of time? These are just a few questions you may want to go over before fully committing to being a homeowner. While there are a number of questions and concerns that come with owning a home, homeownership can have many advantages such as building your equity, creating stability, and discounts on taxes. By paying a mortgage and having ownership of a house it goes towards our financial wellness. While paying rent may not seem like much of an expense for some, it goes directly towards the homeowner of your building or home. The payments made for a mortgage however, would go directly into the purchase of your home. Another advantage is the stability of a living situation. There are a mixture of feelings such as independence and freedom when you are a homeowner. The house that you are staying in is ultimately yours and you have the control to do what you wish with your house. There is no chance of getting kicked out of your house or having your rent raised, and you have the ability to make any home improvements that you wish. Finally, another benefit to being a homeowner is the tax advantages. The first year that you buy a house you will be able to claim discount points on your loan. These points can lower your overall mortgage payment. You can also deduct the interest you pay on your mortgage from your taxable income. These savings can mean huge savings, especially early on in your mortgage when the interest makes up the bulk of your payments. When deciding whether owning a home is the best investment for you and your family just remember that military and veterans already have so many advantages when it comes to getting a VA loan. With a VA home loan there is no down payment requirement for loans up to $424,100 in most parts of the country. In more expensive areas that number goes up as high as $636,150. Regardless of where a veteran lives it is likely that the average mortgage payment is actually less than the average rent for a comparable property. House payments near major military bases in California and Texas could save veterans anywhere from 30-50%. 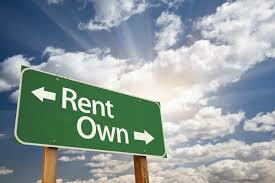 With low mortgage rates and relaxed qualifying, the benefits of owning a home vs. renting are significant. Trading a rent payment for a house payment isn’t an easy decision, so talk with your loan originator to alleviate any questions and concerns you have. Attached is a rent vs. own calculator to help determine how much you would spend/save in either a rental or a home ownership situation. Remember that the numbers given are hypothetical and may or may not apply to each person’s individual situations. The Chapman Lending Team at HomeBridge Financial is honored to help many veterans utilize their VA home loan benefit each and every year. We ARE NOT a call center. Our goal is to provide the best customer service in the industry along with the most competitive rates and fees.